Discussions involve county, Liberty Twp. The Liberty Township Board of Trustees drew a large crowd to its small conference room Tuesday morning for a special meeting. Though it wasn’t on the agenda, residents were there to express their thoughts, feelings, and concerns on the possibility that trustees could turn the township’s EMS over to Delaware County. Many residents were forced to stand in the hall because of the size of the room. After an executive session Monday, the Delaware County Board of Commissioners took action on passing a resolution authorizing the county administrator to present an Emergency Medical Services proposal to the Liberty Township Board of Trustees. Commissioners Gary Merrell and Jeff Benton voted to approve the resolution, while Commissioner Barb Lewis opposed it. In a special meeting Tuesday morning, the Liberty Township Board of Trustees faced a small conference room full of upset constituents who wanted to make sure the township’s cross-trained fire/paramedic model doesn’t change. During the special meeting, Trustee Shyra Eichhorn spoke out against the county taking over the township’s EMS. Trustee Melanie Leneghan said she didn’t know about the commissioners taking action to move forward with the proposal until she had received a phone call about it. “I did not ask for that to occur yesterday, so I don’t know what all this underlying chatter is,” she said. “The reason they were asked for a proposal is they came in, presented a presentation, and we said great, show us a proposal. Considering Tuesday’s gathering was a special meeting of the trustees, Township Administrator Matt Huffman said the trustees had to stick to the items on the agenda and could not comment on anything outside of those items. It didn’t stop the residents from engaging the trustees in conversations concerning the forthcoming proposal. Eichhorn recommended that residents meet with each trustee on the matter to get their viewpoints. Franano said the staffing of an ambulance is three paramedics per unit, per shift. He said according to the Fitch report from Delaware County, the standard will be two paramedics per unit, per shift. The renewal levy passed by voters in 2017 supports the township’s cross-trained fire/paramedic department. Shearer asked why the trustees would consider looking at making the change. “Because it could represent a savings of approximately $4 million a year in taxpayer dollars,” Leneghan told him. “No Melanie, you’re out of control and everybody knows it,” Eichhorn fired back at Leneghan. However, the meeting continued because there were other residents who still wanted to make public comment during the meeting. “Ma’am, I won’t vote for anything that will reduce your service level,” Leneghan told her. According to Lewis, she asked that the EMS topic be placed on the commissioners’ Thursday, Nov. 29 agenda, because she didn’t like Benton’s method to push forward with the proposal to the township. Commissioners meet at 9:30 a.m. in their hearing room inside the Commissioners Building at 101 N. Sandusky St., Delaware. In July, the county commissioners distributed a draft master plan to township trustees throughout Delaware County offering four individual options for EMS, with one of the options being a countywide-run EMS department. The study and corresponding draft were provided by Fitch and Associates of Platte City, Missouri. Michael Frommer, Delaware County administrator, presented the plan to the Liberty Township Board of Trustees during its Oct. 1 regular meeting. 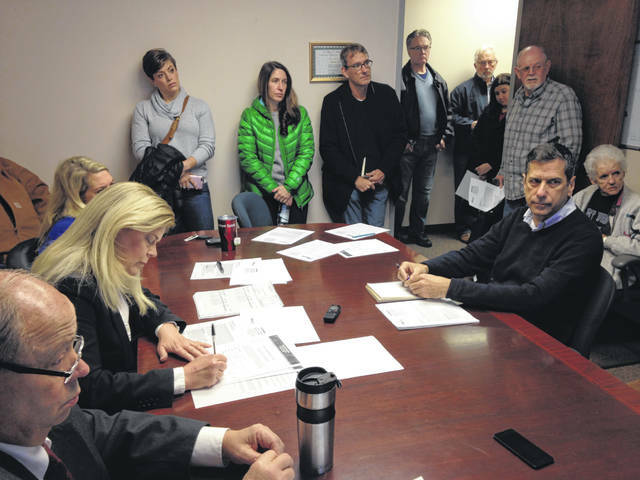 During the commissioners’ Oct. 29 session, trustees and administrators of other townships stood in solidarity with Liberty Township residents against the county taking over the management of the township’s EMS. By the end of the session, those in attendance walked away with an understanding that a task force would be formed to study the matter before moving forward with a proposal. This entry was tagged D. Anthony Botkin, Delaware County EMS, EMS, Fire Department, Greg Russell, Liberty Township, Marie Folmer, Melanie Leneghan, Nico Franano, Shyra Eichhorn. Bookmark the permalink.